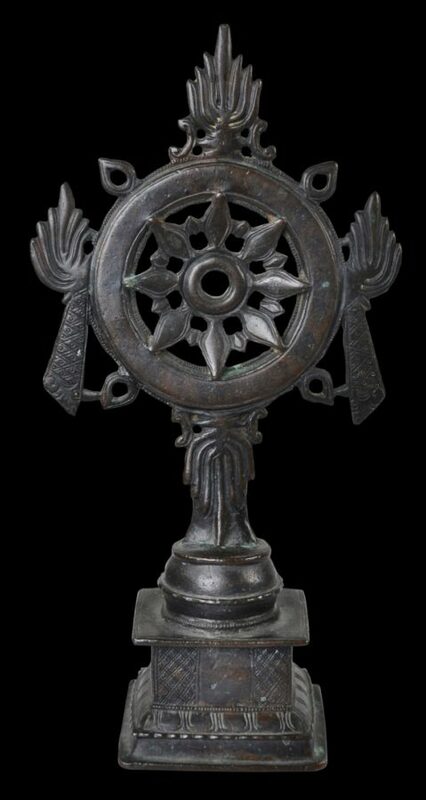 This very decorative tantric flaming wheel of law or chakra (dharma–cakra) wheel has been cast as one piece. The wheel, with eight petal-like spokes and flaming protuberances rises from a square, incised plinth. The chakra has significance to many religious groups in Southeast Asia. Most probably this was intended for Jain worship. Possibly, it is also Hindu – the chakra is a symbol of a number of deities such as Vishnu, and also extensively developed in the goddess tradition of Hinduism known as Shaktism. 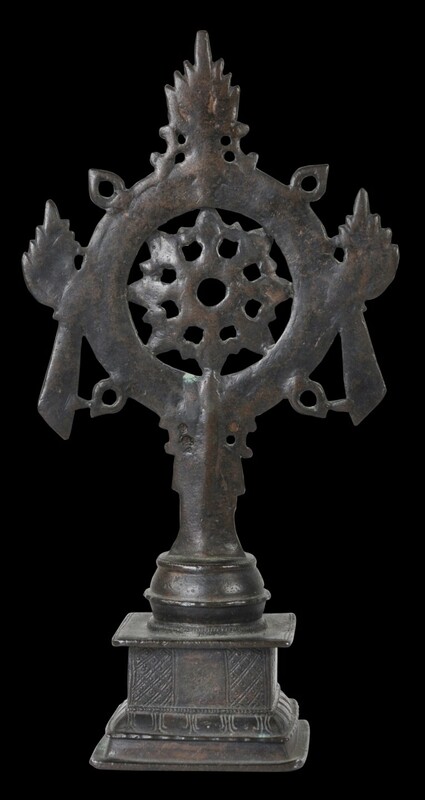 Most Digambara Jaina temples in South India have metal representations of the dharma-cakra and associated motifs. The casting of this piece is very fine. The detailing is clear and crisp and the detail of the wheel itself is varying and dimensional. 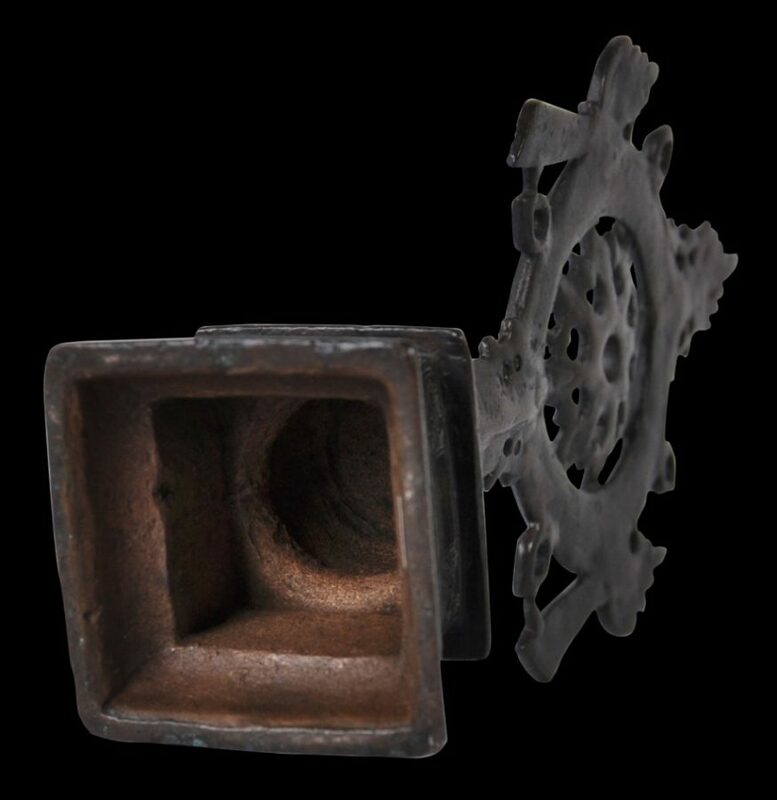 The piece has a dark-chocolate brown patina. It has no losses and sits flatly and evenly. It is a beautiful item. Hegewald, J.A.B., Jaina Temple Architecture in India: The Development of a Distinct Language in Space and Ritual, Verlag Berlin, 2009. Rawson, P., Tantra, Arts Council of Great Britain, 1971.